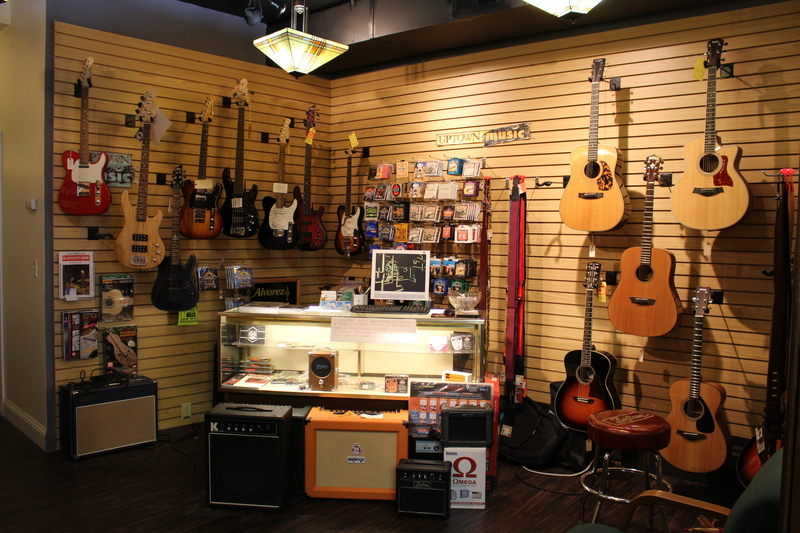 Our mission at UpTown Music in Westerville, OH is to help you create your own music. Listening to music is great. Going to shows and concerts is a blast. But there is nothing like being able to make music for yourself. Playing music makes life better. It may be as simple as strumming three chords, or as challenging as pursuing a career as a professional musician. Wherever your musical aspirations lead you, we have the trained, seasoned, experienced, and professional instructors to help you on your way. We specialize in guitar (electric, acoustic and bass), banjo, mandolin, ukulele, piano, and vocal instruction. We offer expert instruction in most musical styles, music theory, and composition. If you are intending to study music in college we can help you get prepared for auditions and give you a solid base for your musical studies. I am looking to purchase a beginner lesson package as a birthday present. Do you provide the guitar for the lesson or would I need to rent one separately? Hi Annie! Most students have their own guitar. We offer a couple of options of beginner level guitars. Give us a call to get it set up at 614-794-2183. Looking to start playing a guitar. I want to teach myself mostly but figured a couple starter lessons wouldn’t hurt. I agree that lessons at the beginning can be helpful instead of trying to figure it out on your own. Give us a call at 614-794-2183 to get something set up. We can definitely help you with your guitar playing! And please don’t be intimidated by having little experience….that’s why we are here. What does your schedule look like? We offer lessons from 9:30 am to 9:00 pm most days, so I’m sure we can find something that works for you. Feel free to call me at 614-579-9971 and we can discuss what you are looking for in more detail and how we can help you. Good morning! Our son recently purchased a banjo and has been teaching himself to play. We thought it would be great to purchase a package of lessons for him as a Christmas present to help him along. Would love info on lessons. Thanks much! Hi! So I’m close to 50 and I’ve always loved the music the banjo makes. I’ve never touched o d before. Am I teachable? I played the piano when I was young, I really wanted to play the violin but my mom nixed that. I was never very good. I also played the flute in jr high and the snare drum for a second. But that was ages ago. Can I try these instruments with an instructor before I commit? Of course you are teachable! The important thing is that you really want to play something. Sounds like you are interested in a lot of instruments….which one do you want to play? Feel free to call me if you want. Email and text is fine too. Hi! My 13yr old (in 3wks) daughter is interested in mandolin lessons. Do you still offer them & can we rent the mandolin from you as well? SO sorry to take so long to get back to you! I somehow missed your message. My apology. We do indeed offer mandolin lessons, and if you haven’t found a mandolin yet let me know and we can work out a rental arrangement. Feel free to call me if you want and we can work out details. Hello ! We are interested in learning more about group ukulele lessons which I saw an advertisement for. Please let us know . Thank you! We are presently discussing starting a group Uke class because we’ve had several inquiries. We’ll be in touch if/when we get a group scheduled. At the moment we don’t have a group lessons scheduled, but we offer individual lessons Monday-Thursday and Saturday. Feel free to call me to discuss details. Do you already have a uke? This may be a unusual request. We’re you open in 1966? My parents bought me a violin in Westerville when I was 9 and I’m trying to trace its origins. No, we weren’t around in ’66. They may have got it from what is now “Music and Arts” beside Church of the Messiah on State Street. It used to be Colonial Music, and before that it was a music and gift store by some other name. They’ve been around a long time. That would be my best guess. Good luck with your research! Looking for in home beginner lessons for myself and our 6 yr old. Isthis something you offer and what is the cost? We don’t generally do in-home lessons, but if you let me know where you live and what time you are looking for we might be ble to work something out. I can certainly fix your banjo for you. Feel free to call my cell so we can arrange a time. My son (18) is looking for a classical guitar teacher. He would prefer lessons on the weekend as his college schedule changes from semester to semester. Right now neither of our classical guitar teachers teach on Saturday. Let me look around and get back to you. A recommendation would be Bob Firestone at Guitar House Workshop. Their number is: 614-488-2477. Bob is really good! Let me know if they can help you. If not get back to me and we will see if we can find a teacher for you.